Pencils 4 Kids had a very productive mission trip to Quickstep in December. We had all hands on deck to finish off the perimeter fencing to make the school’s grounds a safe haven for the students. Our largest and most exciting project kicked off as well. We broke ground on the community’s first ever library! This will be such a beneficial addition for both the students and their families as it will be open to any and all who need it. Since we have returned there have been many hard working community volunteers who continue to where we left off. They are working tirelessly to finish the library soon. Look out for a book drive coming soon as we hope to fill up the library will all kinds of reading materials and resources for Quickstep. If you are interested in joining us in Jamaica please let us know, it’s not too late. As always you can donate to help make this dream a reality. Pencils 4 Kids wants to wish a huge congratulations to the graduates of the 2018 class. We so thankful to witness your growth each year. Your bright smiles and continued gratitude remind us why it is so important to continue our efforts. We wish you success in making all your dreams into a reality! As always, we wanted to thank all of the volunteers, donors, and supporters for their efforts to make Pencils 4 Kids a success. Much was accomplished during our annual mission trip due to your generosity with your time and efforts. We could not do this without you! As safety is top priority at Quickstep, we were able to enhance the perimeter fence ensuring their security. The playing field and steps were also completed and now the students can truly enjoy their athletic endeavors. We also worked hard to fix the drainage system to ensure a clean water supply for all the students and staff members. The school itself got a face lift with a fresh coat of paint. Volunteers, students, teachers and community members worked side by side to make Quickstep look as good as new. We are looking forward to this coming year and mission trip. We hope to tackle some big projects. Stay tuned! We are thankful to have a great relationship and support system from all the staff of Quickstep Primary school. It is with their help that we are able to maximize our efforts to do what is the best in the interests of the students and the school. Below is our latest correspondence with the principal of Quickstep. We are very excited about our projects for this years' mission trip! Here at Pencils 4 Kids we are busy gearing up for our annual mission trip to Quickstep, Jamaica this December. It will be our 5th annual trip where we hope to further the great progress already made in upgrading the school infrastructure and educational opportunities for the children. With this years’ mission trip we have an ambitious plan to redevelop the sports field and help further secure the school through construction of perimeter fencing. We appreciate any support whether as a volunteer or a donation. Every little bit helps and truly makes a difference in the lives of the children we serve. 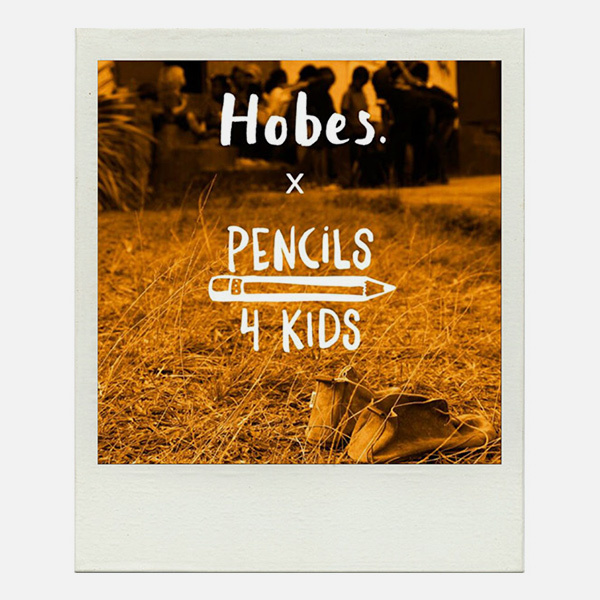 We are proud to partner up with our friends at Hobes and CW Pencils on a project to benefit Pencils 4 Kids. All proceeds from Tots Hobes sales from now until April 1 will be donated to our organization to help provide school supplies to underprivileged kids around the world. Give the babes in your life super sweet footwear all while benefiting an important cause. Please check it out! Our annual trip to Quickstep in December our biggest to date. We had 35 volunteers join us in our continues efforts to improve the school. With our manpower we were able to completely pave a new entry and driveway. Pencils 4 Kids also made a much needed and protective walkway between the main building and the kitchen. Other projects included a revamp of the garden and fixing the water fountain. The generous donors were responsible for the gifting of a new refrigerator. Of course we continued our tradition of giving each student their own Pencils 4 Kids backpack filled with essential school supplies. We thank each and every one of our volunteers and all the donors for their generosity. In June 2015, the 6th graders of Quickstep Primary school graduated. Pencils 4 Kids have watched these students grow and develop over the past four years. In an effort to foster a reward for these incredibly determined kids, our charity has gifted a tablet to each student achieving high marks. We wish them the best of luck with high school and beyond! !